eCite - How customer satisfaction, corporate image and customer loyalty are related? How customer satisfaction, corporate image and customer loyalty are related? Customer satisfaction, corporate image, and loyalty seem to play significant roles in companies since they are highly correlated with profitability. 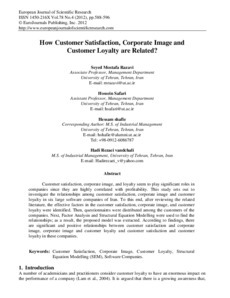 This study sets out to investigate the relationships among customer satisfaction, corporate image and customer loyalty in six large software companies of Iran. To this end, after reviewing the related literature, the effective factors in the customer satisfaction, corporate image, and customer loyalty were identified. Then, questionnaires were distributed among the customers of the companies. Next, Factor Analysis and Structural Equation Modelling were used to find the relationships; as a result, the proposed model was extracted. According to findings, there are significant and positive relationships between customer satisfaction and corporate image, corporate image and customer loyalty and customer satisfaction and customer loyalty in these companies.